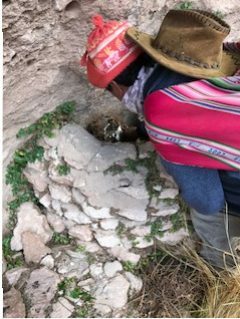 Written by Stephanie Marren, 2017 Bolivia: Lands & Livelihoods 10:40: What an incredible two days. Yesterday we left at 6 am for Challa Apacheta with Agua Sostentable; the drive took about four hours. Our driver Enrique was really nice, and we made a couple stops. The first stop was to check out the cacti that bloom every 10 years called Puyas in a town called Comanche; massive, incredible plant life. 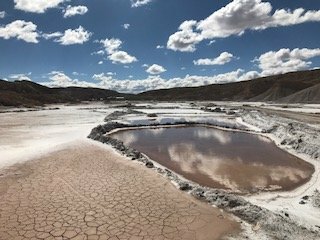 The second was in a town that mines salt and rocks called Tarqui Amaya, which had some of the most beautiful scenery I have ever seen. 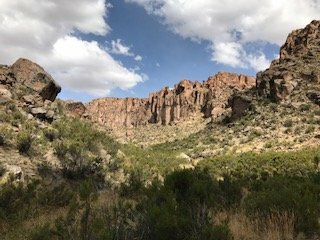 We made it to Challa Apacheta right around lunch and received the nicest, most welcoming greeting I have ever had in my life. We had soup and bread, and then started the work. We installed a water tank for collecting rain water and cleared shrubs to make a road to access the spring more easily – it was hard work, but very cool to see the progress (an almost 800 meter long road)! We came back right before dark to eat dinner – the cholitas Juana and Celia made quinoa “meat” (soy) and rice, which was super delicious. We looked at the stars, since they’re different in the southern hemisphere, and slept outside. We woke up at sunrise right after the locals sacrificed a llama in our honor as a thank you for our hard work and contributions. Afterward, we ate bread with dulce de leche and drank tea for breakfast, then going back to the road to clear more shrubbery while listening to music. 12:30: We started hiking to the spring, which was so beautiful. The locals took us a little further on to see the chulpa (basically a tomb) of an ancient Incan person. Apparently we were the first people not from the town to ever see the spring, valley (called valle del caballo), or tomb – so incredibly cool. We made it back to the house around 2 for the llama-q. How incredibly amazing was it that it was seen worthy for them to sacrifice a llama in our honor? Not many people can say that. Right before we left, an incredibly heart-felt speech was given thanking us – a total tear jerker, and honestly one of the top 5 best moments of my life. How lucky we all are, every single one of us, to have one another. The car ride home was easy; we listened to music, talked, told jokes, and laughed. We made it back to the hostel around 8:30, ate another giant pizza, and I’m now ready to crash. We leave for Sucre tomorrow on a night bus – so blessed for this life, and so grateful for this experience. Now time for sleep!